The Lobster Guys are committed to zero waste, and to the sustainable operation of your live lobster tanks at store level. We accomplish this by providing self-empowering educational and technological solutions directly to your team members – and together building a foundation for product health and profitability. 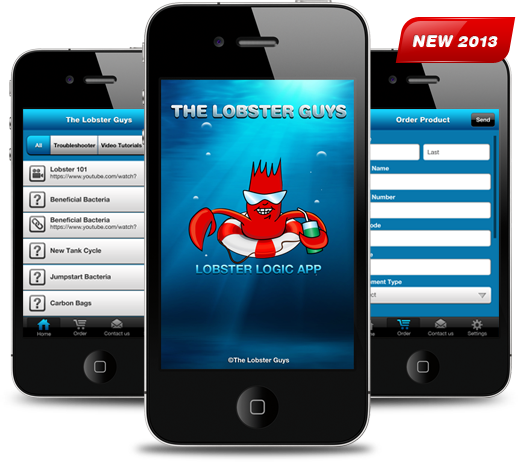 Lobster Logic puts twenty-five years of lobster tank troubleshooting expertise in the palm of your hand. Instantly turn any novice lobster wrangler into a pro. Stop second guessing tank issues, reduce shrinkage, prevent waste, troubleshoot problems, order supplies, set automatic service reminders, request assistance, view tank specific video tutorials, and more. Available in English and Spanish. Lobster Logic App can be downloaded freely from the App Store / Play Store, whereas to view the contents of the app you need to register. Do you want to register?